A day after President Obama acknowledged that US military operations have moved beyond humanitarian assistance to support of a counter-offensive against the Islamic State, the Pentagon has pushed for airstrikes to be carried out in the west of Iraq as well as the north. 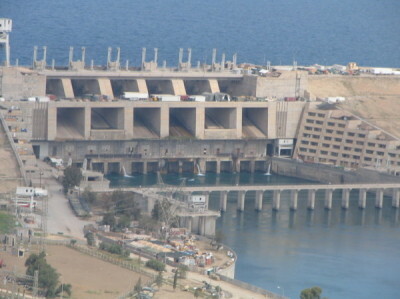 Officials said the strikes would help defend the Haditha Dam (pictured) against assaults by the jihadists. Over the weekend, dozens of American aerial attacks helped Kurdish fighters recapture the Mosul Dam, Iraq’s largest, from the Islamic State. Military officials say the Mosul Dam campaign could become the model for further operations — massive American air power with no regular US forces on the ground. The comments by the officials, made to The Wall Street Journal, appear to be an attempt to swing the Administration behind the extension of operations. Others in the Government, including President Obama, are said to be reluctant to move beyond the strikes in the north. The article also claims, without evidence, that Sunni leaders in Anbar are calling for the American strikes.